Ribs Express uses their own specialised couriers to deliver their food. Our wings are infused oven baked then chargrilled with your choice of sweet BBQ sauce or spicy chipotle glaze. Roast potatoes, onion, sweet potato, eggplant and capsicum on a bed of rocket leaf accompanied by a wholegrain mustard vinaigrette. Beef minced, grated carrot, cheese, onion and peas in gravy topped with mashed potato. 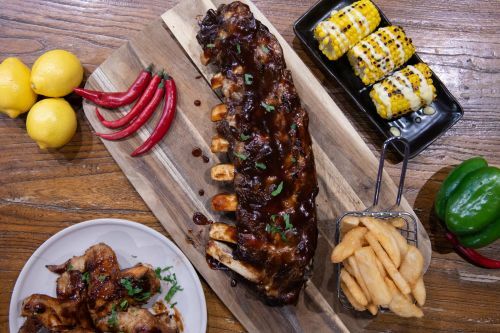 Half or full rack of chargrilled pork ribs based with either house barbecue sauce or Chipotle sauce served with one side. Grilled 300g veal rib-eye served 10 pieces with creamy garlic prawns. Half or full rack of char grilled lamb ribs based with either house barbecue sauce or chipotle sauce served with coleslaw. Half or full rack of chargrilled beef ribs based with either house BBQ sauce or chipotle sauce served with coleslaw. Half rack of lamb ribs and pork ribs. Half rack of beef ribs and lamb ribs. Half rack of beef ribs and pork ribs. Half rack of lamb ribs, pork ribs and beef ribs. Premium scotch fillet, char grilled to perfection served with fresh side salad, beer battered chips. Tender Lamb cutlets char grilled with a herb and lemon butter glazed served with potato mashed. Red cabbage, green cabbage, carrot and onion and in home mode dressing. Mixed leaf, cucumber, tomato, onion and parmesan cheese. Mixed leaf, tomato, cucumber, onion, roast capsicum, olives, feta and oregano accompanied with greek salad dressing. Baby rocket, cherry tomatoes and shaved parmesan cheese with a balsamic and extra virgin olive oil vinaigrette. Baby rocket, roasted potatoes, onion, sweet potato, pumpkin and eggplant. Baby rocket, semi-dried tomatoes and shaved parmesan cheese with red wine vinegar and extra virgin olive oil vinaigrette. Fresh corn on the cob grilled with butter. Green cabbage, red cabbage and carrot in a homemade dressing. Deep fried sweet potato served with beetroot aioli. Crispy traditional Spanish dessert sprinkled with sugar and cinnamon served with a rich hot chocolate dip. cheese, fresh strawberries or banana and icing sugar.